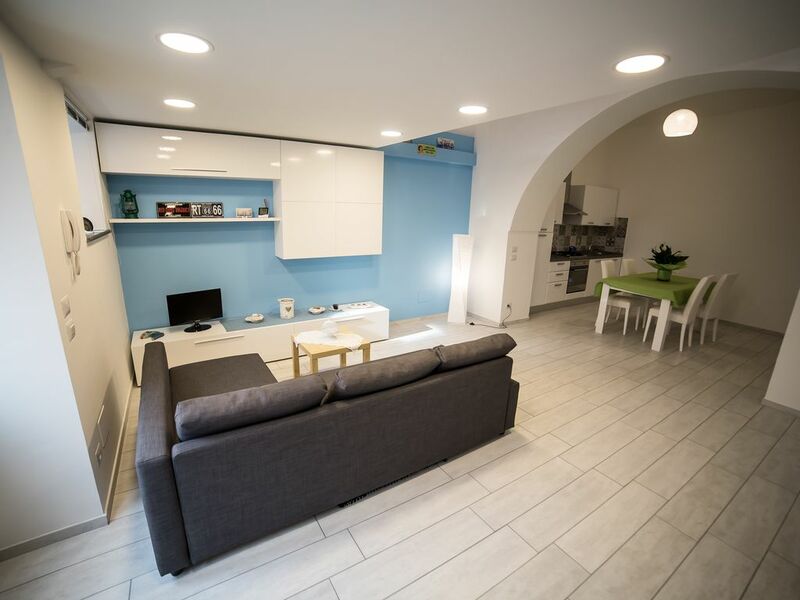 The apartment is located in Massa Lubrense directly down to the beach of Marina Lobra, with convenient access directly from the village suitable for disabled people. It consists of a large living area well furnished in modern style and equipped with a comfortable sofa bed. The well-equipped kitchen is equipped with everything you need to cook and spend your holiday in maximum comfort. The bathroom has a large walk-in shower, toilet and bidet. Upstairs is the sleeping area where you will find a double bed, bedside tables and a characteristic sea view balcony. Wifi internet throughout the apartment. Valerio stayed and waited for us an hour after we said we’d arrive (9pm) and was very gracious as he was likely waiting to go home. The location is amazing, literally steps away from the water. However, I recommend you have a car as it is a long road up to the town. My only complaint was the apartment was quite cold, which is probably very nice in the summer and we couldn’t find a temp gauge. This place was perfect for my husband and I. It’s very local, right by the marina in a quiet area. Valerio was awesome and very helpful with any questions we had. There are a few local restaurants within walking distance that are delicious. We really felt like locals staying here. Un lugar verdaderamente apacible, la gente muy cálida, un trato familiar en un ámbito que conserva la tranquilidad pese a la cercanía del bullicio. Muy recomendable. We loved our stay here. The view was beautiful and it was such a peaceful place to stay! Everything about this home is awesome, the host - Valerio, the location, the ocean which is the closest and just about everything! Loved our stay here and Valerio was very helpful in helping us figuring out ferry transports and other stuff around town. Definitely recommended! Awesome location , owner & father very accommodating. Great for relaxing by the sea. Wonderful spot to visit Positano & Amalfi Coast by boat just a few steps from the door. Apartment was as described & great little store within steps that has everything you could need including bus tickets to sorrento! Would recommend if you want to get away from the crowds, relax & enjoy the sea. This prestigious apartment is located directly in the village of Marina Lobra at Massa Lubrense, where the immediate vicinity you can find bars where you can enjoy a delicious lemon granita, restaurants that prepare dishes with fish of the day and delicatessens. Also on the pier you can book your boat trip to Capri, Positano and Amalfi. A few meters you can reach a rocky beach where you can hire sunbeds and umbrellas. For lovers of the beach with sand in less than 5 minutes by car or bus you will reach the beach of Marina di Puolo. At 10 meters away there is the bus stop with which you can visit Sorrento, Sant'Agata, Positano and the famous beach of Marina Cantone in Nerano. Our structure is the ideal accommodation for you if you want to spend your holidays in a typical new apartment in fisherman style, with all modern conveniences, to enjoy the typical atmosphere of Southern Italy, admire and enjoy the sea and unforgettable sunsets, taste best dishes and visit the city without a car. If you come by car you can park in the immediate vicinity where there is a guarded parking fee.